I’ve discovered that I have a favorite “recipe” for decorating my fireplace for spring that I use over and over again. I love to use some variation of each one of the “ingredients” every year! a tall element in the center – great for giving more presence to wreaths, art, etc. If you missed it, make sure to read my post, The Secret To A Pulled Together Room And How To Achieve It, and you’ll understand just why having a backdrop is so important. placing faux boxwood orbs, instead of candles, atop chunky candlesticks. Texture can be added with baskets, flowers and plants, branches, etc. Even the louvered shutters, that are a part of my backdrop, provide texture. This is another element to fireplace decorating that you’ll find me using year round. I especially love thick, chunky, heavy pieces of crockery as opposed to delicate porcelain pieces. 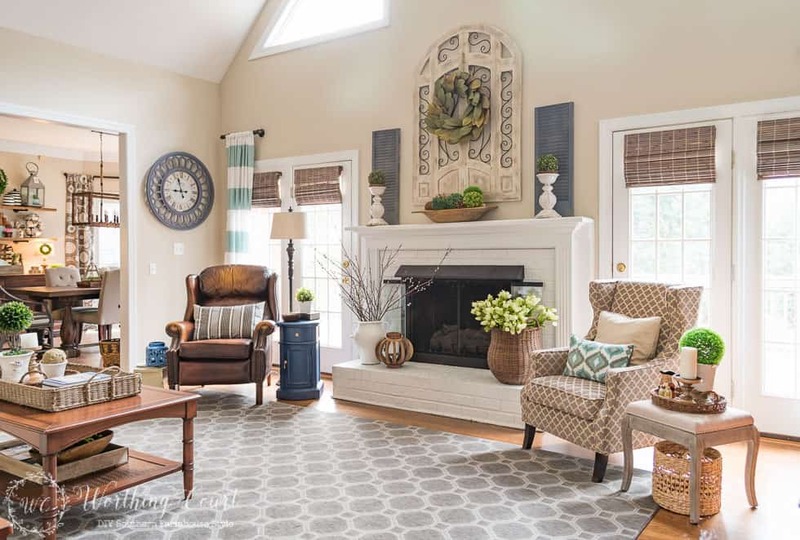 Adding the color green for spring decorating kind of goes without saying, but my other favorite color to use in the spring is a soft shade of blue. It’s difficult to see in this picture, but I carried a bit of that same soft shade of blue from the hearth up to the mantel, by placing a blue candlestick inside the tall lantern. So, tell me – do you have a favorite decorating “recipe” that you like to use? What’s your most used “ingredient”? Love your touches of greenery, it add so much! 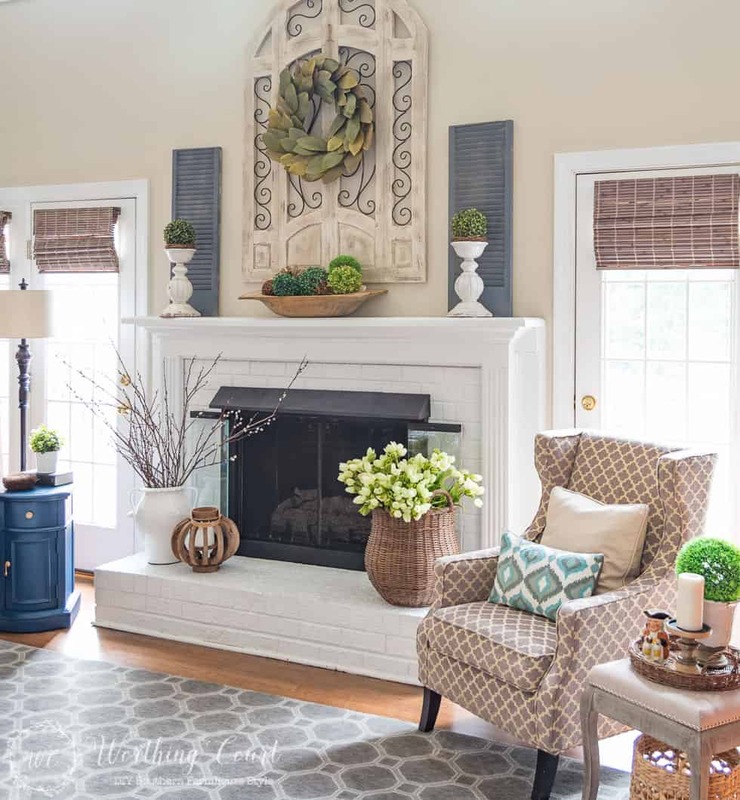 Your mantle is so pretty; especially love that wooden bowl! Very homey and welcoming!!!!! Beautiful! Your house makes me sigh and relax at the same time. It certainly feels like a happy home. Love your style. I love the way you reuse items throughout your house and add something simple like a orb or plant. What is your wall color. I love your mantel . Greenery adds so much this time of year!! I love your mantel. Move the mantel. I just bought a dough howl and I have so many places that I want to put it. Greenery looks good in it. Love your decor! My husband just brought home a metal bowl (he actually found on the side of the road!) that is shaped like the one you have on your mantel with the orbs in it. I’m going to go get some of those orbs today! 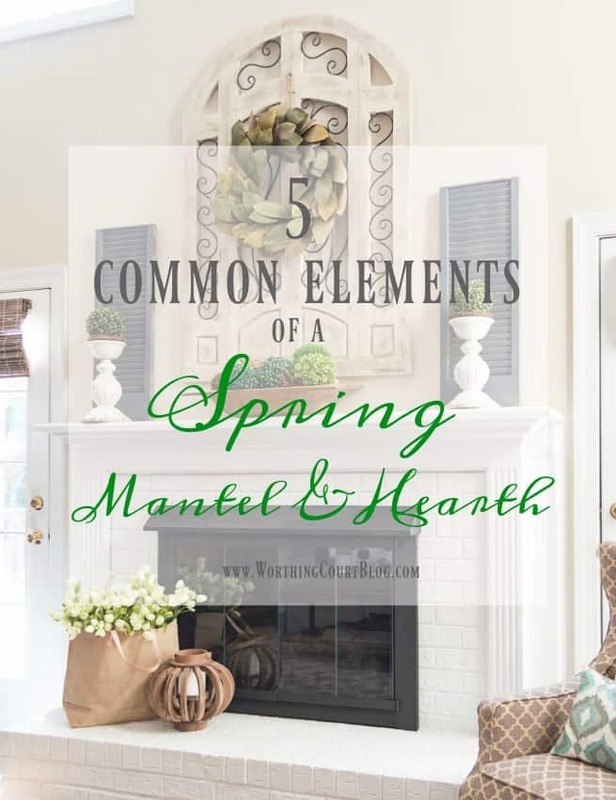 I love your mantel and the way you decorate it for every season! Thanks for sharing your great tips! My permanent mantle decor is a large grapevine wreath that I decorate according to the season… All else is according to whim. I enjoy the beauty you create. May I ask where you purchased your shades? Hi Erin. I purchased my shades at Home Depot. Here’s the link to them: http://fave.co/1V3n3rS . They come in all different widths. Your pictures, of your home, are so inspiring. You make me want to stop looking at all the beautiful pictures and get off my couch and start decorating! It seems I have most of the pieces of great decorating but loggy gag about doing the decorating! I agree with all the other comments. 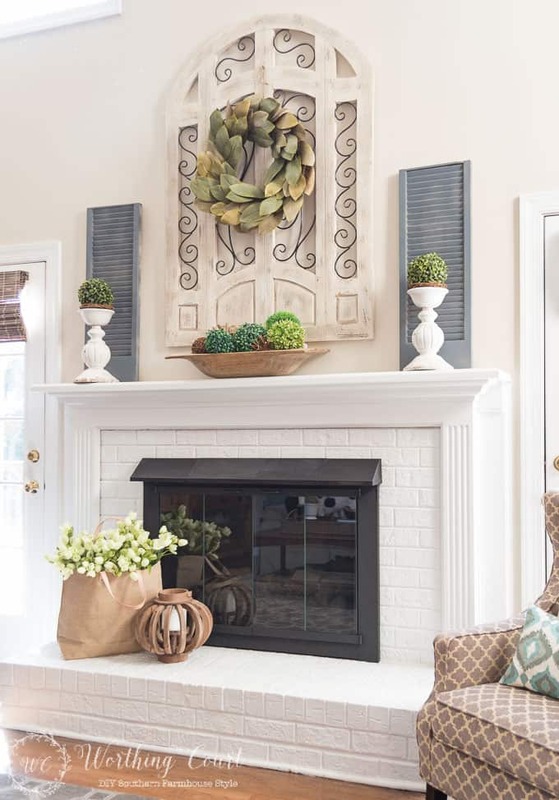 The wreath over the mantel, is that real magnolia leafs or faux? Great job in your Spring mantel! I love the magnolia leaf wreath, chunky candlesticks, and wooden bowl. Love all of your ideas and your beautiful home! Thanks for the tips! I love all the greenery and how bright it is with the windows open. So inviting. Thanks again for all the inspiration. Those are all great ideas! I really like the lantern with the blue candle inside. Lovely. I really like both mantels you have pictured. Light and airy! Love the use of shutters. I use old chipped shutters all the time. They bring needed height and roughs up some of the “pretty” pieces I use so it isn’t too cute or fussy. Love all your posts and ideas. Gorgeous! I love that you include the hearth in your mantel decorating scheme. 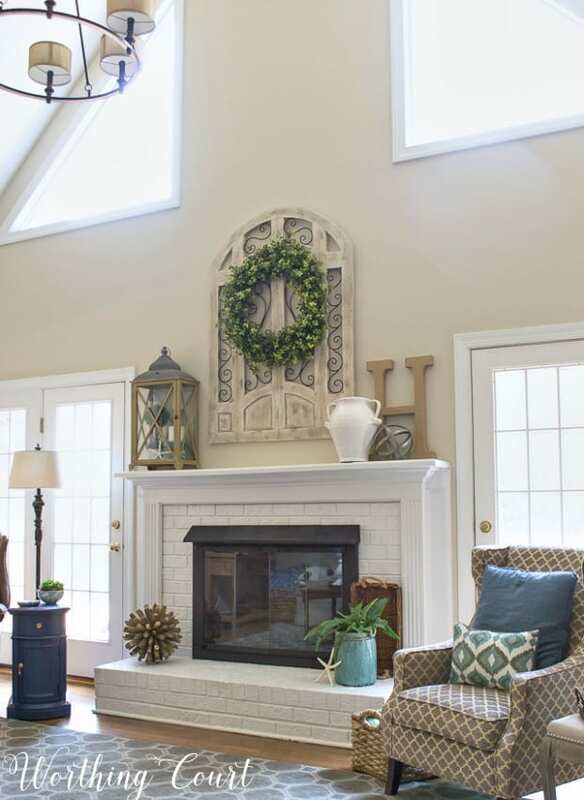 Your vaulted ceiling and high windows add to the drama of your mantel and fireplace area. I love that you’ve chosen décor pieces that fit with the large scale of that wall. It’s really so effective! Your mantel is so lovely and so is the rest of your room. So cozy and warm. I have always loved to use green in the spring on my mantel, but I love your little touch of blue. Can you tell me where I can purchase the center wood and iron piece you used on the mantel, it’s so beautiful. Hi Margie. You can find where to purchase the iron and wood frame in this blog post: https://www.worthingcourtblog.com/shopping-guide-to-worthing-court/ . The orb was purchased at West Elm (I don’t believe that they carry it any longer), both vases were purchased at TJ Maxx and the letter H was purchased at a local shop, but you can probably find them on Amazon. Where is your wreath from? Im obsessed with it! And the candle holders on each end of the mantel 🙂 I’ve been looking for something chunky like that and have been unable to find exactly what I’m looking for!